The largest and best known spa town in the Czech Republic, famous for the curative eff ects of the hot springs in the Teplá River valley. There are only a few places on earth that are as picturesque and beautiful as Karlovy Vary. The town is located in the northern part of the Slavkov Forest at an altitude of 375 - 644 metres above sea level. The local nature has helped people to renew their strength and to rejuvenate their tired bodies with the help of thermal mineral springs and their ion solution for a very long time. Rain water from the surrounding woods seeps through the fi ssures in the soil to a depth of 2000-5000 metres where it stays for many years. It is heatedby magma and enriched by carbon dioxide and mineral substances, and eventually it springs up to the surface full of therapeutic properties. In total, there are about 80 thermal springs here. Nowadays, 15 springs are directed into spring tanks. 2000 litres of water at 73°C come up from the earth interior each minute. The water contains 6.4 g of minerals in each litre. The Karlovy Vary springs, with a prevalence of hydrogen carbonic sulphur chloride ions, are classifi ed as warm alkali Glauber salt water. The most signifi cant cultural event in Karlovy Vary is the International Film Festival; however, theatre and music (the Karlovy Vary Symphonic Orchestra was founded in 1835 as one of the oldest in Europe) have their tradition too. The Dvo?ák Karlovy Vary Autumn music festival takes place in Karlovy Vary annually, too. Golf, horse-racing, tennis etc. rank among the leading sports activities. Karlovy Vary is proud about many products connected with this town: the Becherovka liqueur, Moser glass, and the hundred-year production of porcelain. Such personalities as the Russian Tsar Peter the Great, Holy Roman Empress Maria Theresa, French Empress Maria Louisa, Emperor Franz Joseph I, Johann S. Bach, Johann W. Goethe, Giacomo Casanova, Friedrich Schiller, Ludwig van Beethoven, Karl Marx, Richard Strauss and many others are among the notable visitors to Karlovy Vary. The thermal springs, unique in their composition, belong among the most eff ective mineral waters in the world. The Karlovy Vary Hot Spring (V?ídlo), the mightiest of the springs, jets from the depth of 2,000 m, with the spring discharge of 1,500 l per minute. The Bristol Hotel Group is a self-contained health spa complex in Karlovy Vary. All of the hotels` spa facilities are linked by heated underground passageways to ensure maximum comfort for guests, which provide easy and convenient access to all amenities offered by the spa group. The Bristol Group Hotel complex lies in its own nature park in the center of the resort, close to the source of the mineral springs. The hotel, built in 1890 in the classical architectural style, underwent restoration in 1998. Spa Hotel Kolonada **** with its position opposite to a historical colonade with the most of hot springs at your fingertips offers you to enjoy your stay. You´ll find luxurious equipment, wide range of services and facilities and all spa treatment as well as hot mineral water under one roof of this distinguished ho­tel. Kolonada spa is situated in the resort center, opposite the Minsk Colonnade, and in close proximity to the springs. Originally erected in 1850, a full restoration of spa hotel was carried out in 2006. All treatments and procedures take place in the spa center. Situated in the heart of Karlovy Vary’s famous spa area, Venus Hotel has comfortable rooms with satellite TV. The hotel also offers a range of spa and health treatments. Venus Hotel has its own gourmet restaurant and guests can have meals tailored to suit their diet needs. At Hotel Venus’s spa guests can have a range of treatments, all done by medical professionals. Aside from whirlpool baths and massages, soft laser therapy and oxygen therapy are among the treatments offered. The spa hotel Thermal provides comfortable accommodation in single rooms and double rooms or in suites. The rooms with loggias render a pictorial view of the spa district of the city. The hotel premises have a thermal swimming pool, fitness, sauna, solarium, underground garages, parking lot, exchange office, internet café, hairdresser’s, pedicure and manicure studios and an appealing boutique. The Dvorák hotel is located at the Tepla River, not far from the spa colonnades. It offers 126 fashionably furnished room categorized as ‘standard’ and ‘comfort’. Its also has wheelchair accessible rooms and suites. Furnishings: bathroom, WC, telephone, minibar, radio, TV, SAT, hair drier, air-conditioning, iron, strong box, and the internet. Inside the hotel you can find the Dvo?ák restaurant, a coffee room and the bar Opera. The great advantage of this hotel is its own balneological facility with a spa doctor. A very convenient location in the spa district centre, opposite the Mill ("Mlýnská") Colonnade with healing springs. 28 single and 72 double bedrooms are available in five interconnected houses, which underwent extensive reconstruction and modernisation in 2001 - 2002. All the rooms within the sanatorium are furnished in a modern and comfortable style, including a TV (satellite), radio, telephone, and refrigerator, and have ensuite toilet & shower/bath. In The sanatorium there are 33 single and double rooms, 2 suites (for 4 persons) with all conveniences and satellite TV. The single rooms face a wood, most of the double and suites are with wonderful view of SPA area of the town. The sanatorium provides treatment of diseases of digestive tract and chronic joint and spine disorders. The sanatorium provides following procedures: Hydrotherapy, sauna, electrotherapy, inhalation, gas injection, massages etc. The price of treatment is inclusive of full board - diet food..
Wellness And Spa Hotel Ambiente offers tastefully furnished rooms and suites. Furnishings: bathroom with a shower cabinet or bathtub, toilet, TV, SAT, telephone, minibar, hall, changing room, spacious living room and bedroom. Reception desk is open nonstop. The premises include the Ambiente restaurant, coffee room, hotel terrace. The hotel has its own balneological facility ensuring a wide range of therapeutic procedures provided by professionals. In addition to classical spa and wellness procedures, the hotel also offers modern methods of balneotherapy as well as nontraditional procedures such as Finnish sauna, whirlpool, aroma therapy, etc. The hotel also has its own garage. Hotel Imperial is one of the top spa facilities providing complex spa care of the highest quality. It combines traditional procedures with modern trends in spa treatment. Built in the classical style and recently reconstructed, the Imperial hotel offers its clients a standard of comfort and service to satisfy even the most exacting guests. The hotel, an interpretation of a Romantic castle from the Middle ages, has watched proudly over the city since 1912. The four-star hotel Imperial is located in a picturesque part of the city, in its own grounds with covered tennis courts and good transport links – a funicular railway and buses take guests to the center of the city, which are free for guests undergoing spa treatment. Historical building of spa hotel Kriván is situated in a spa centre of Karlovy Vary, in a close vicinity of Park and Mill Colonnades. The main Carlsbad's colonnade, the Mill Colonnade, is only 2 minutes within walking distance from spa hotel Kriván. Another Carlsbad's colonnade, Park Colonnade, is situated directly opposite the main entrance of hotel Kriván. Behind it guests have an opportunity to spend there a pleasant leisure time in one of the town parks – in Dvorák's Park. Suitable location of hotel, i.e. in the vicinity of colonnades with mineral springs, town park as well as 10 minutes within walking distance from business zone, that all gives clients possibility of pleasant stay. Hotel Praga is situated in Sadova Street not far from the Colonnade and offers its guests accommodation in comfortably equipped rooms. If you would like to find a quiet place with a classic environment and comfort, near to medical springs, hotel is Praga the right choice for you. 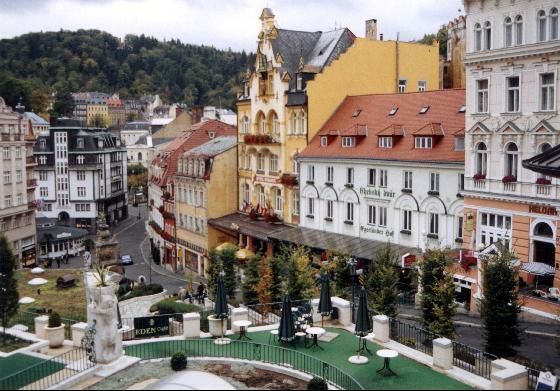 Set in the heart of Karlovy Vary, this hotel is close to Diana Lookout Tower. Features.Recreational amenities include a health club, a sauna, and a steam room. The property's full-service health spa has massage/treatment rooms. This 4.0-star property offers small meeting rooms, a technology helpdesk, and limo/town car service. Wireless Internet access (surcharge) is available in public areas. Wedding services and tour/ticket assistance are available. Additional property amenities include multilingual staff and currency exchange. This is a smoke-free property. Guestrooms. The Richmond Park hotel is located in a calm part of Karlovy Vary on the bank of the Tepla river and is surrounded by an English-style park. In this park there are situated an original Japanese meditation garden and a lovely small pavilion with a well called Stephanie. The comprehensive spa treatment in Karlovy Vary has been based on a tradition more than 600 years old. There are two casinos in the town, one of them located only 100 metres from hotel Richmond. Spa hotel Jessenius offers among other treatments also traditional massages, electrotherapy, parafango, oxygen therapy, pneumo acupuncture, mineral water baths, drinking cures and dietary meals. The hotel guests can also relax in the hotel restaurant and in summer months enjoy summer terrace with a direct view of the colonnade. We believe that the hotel services will be appreciated not only by the spa guests but also by clients who come to Carlsbad to relax and gain new energy. Hotel Esplanade I. situated close to the Carlsbad spring V?ídlo offers its guests comfortable accommodation in pleasantly furnished rooms of 3* category. Hotel does not dispose of catering premises and own in-house spa therapy facilities and his guests can use restaurant and spa procedures of hotel Jessenius (cca 50 m). The guests can take an advantage of the location of the hotels to the spring that makes it comfortable for them to follow the drinking cure as the basis of spa treatment. The Spa Resort Sanssouci is a new spa complex. It has been created on the quiet side of the spa zone of Karlovy Vary (Carlsbad) by merging three important spa facilities: The Švýcarský dv?r (Swiss court) Hotel, the Sanssouci Hotel, and the Mercedes Villa. After a comprehensive reconstruction, which included the construction of an underground connecting corridor, it offers its guests maximum comfort “under one roof”.